Arrival at El Dorado International Airport in Bogota. Reception and transfer to the hotel of your choice. Breakfast at the Hotel. While in Bogota, you cannot miss this tour. You will start your journey by visiting the historic heart of Bogota. We will walk around Plaza de Bolivar and surrounding areas, where you will be able to see the National Capitol, which is the seat of the Colombian Congress; la Casa de los Comuneros, the Presidential Palace (Casa de Nariño) and the Museum Santa Clara Church. 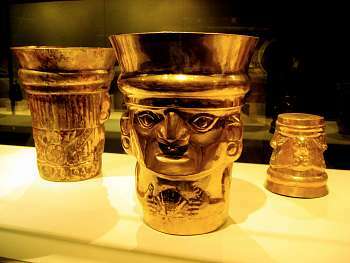 Then you will be able to discover the metalworking processes of more than 34,000 pieces of metalwork displayed at the Gold Museum from various Hispanic cultures. From there, we will visit the House belonged to Simon Bolivar (Quinta de Bolivar) and lastly, the iconic symbol of Bogota, the Monserrate Hill, that rises at 3,152 meters above the sea level. It can be accessed by a funicular. There, you can visit the sanctuary and enjoy the best view of Bogota. Museums are closed on Mondays. Accommodation. Breakfast at the Hotel. Flight to San Andres Island. Pick up at the Hotel as scheduled. Reception at the Rojas Pinilla Airport, transfer to the hotel of your choice. Accommodation. Breakfast at the hotel. Pick-up at the hotel in the morning to “go around the Island” to visit the major tourist attractions, such as, la Cueva de Morgan (Morgan’s Cave), where the pirate used to hide his treasures; el Hoyo Soplador, the South Bay beach and San Luis, a beautiful area full of history and culture. Return to the hotel. Accommodation. Breakfast at the hotel. Day free for personal activities. Accommodation. Pick-up at the hotel as scheduled and transfer to the airport to take an early flight to Providence Island. Reception at El Embrujo Airport and transfer to the hotel of your choice. After arrival, you will be taken for a walk around the beautiful island of Providencia to explore and learn a little about its history, culture and the traditional way of life of the islanders. You will have the chance to observe traditional settlements and the beauty of the original architecture. Walking around Providencia and Santa Catalina you will be able to feel how the Creole people live, and witness the natives’ passion for the island. Typical Lunch included. Return to the hotel. Accommodation. Breakfast. Meeting at the hotel in the morning and pick-up for the “Boat Trip around the Island”. In this lovely trip around the island you would have the opportunity to take a close look at the most outstanding and breathtaking landscapes that make an important part of the natural and cultural heritage of Prividencia and Santa Catalina. 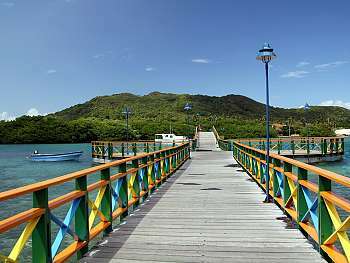 During this trip, you will be able to see the long wooden footbridge known as “Lovers bridge” that connects Santa Catalina with Providencia, and also walk by Morgan’s head for some snorkeling in warm, tropical crystal clear waters at the McBean Lagoon National Natural Park, one of the most imposing natural parks of the western hemisphere. After enjoying this spectacular experience, we will arrive at Manzanillo beach. Typical Lunch included. Return to the Hotel. Accommodation. Breakfast. Pick-up at the hotel as scheduled for transfer to El Embrujo airport to take the first flight to San Andrés and then to take a connecting flight. 2 Nights Lodging with buffet breakfast. 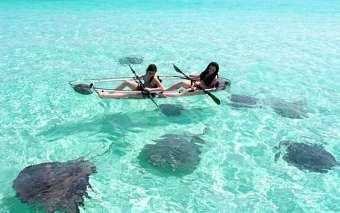 Described tours in Private services with English speaking guide. 3 Nights Loging with breakfast. 2 Nights Lodging with Breakfast.